Last Friday we celebrated Kevin's birthday. Here is the card I made for him. I have so much trouble making male cards. I don't have any masculine stamp sets so this is what I came up with. I'm not sure how much I like it but I had fun making it and hubby liked it. 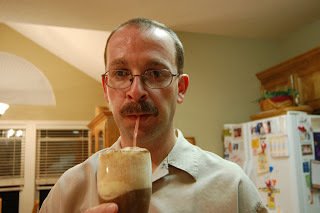 We invited some friends over and had root beer floats instead of cake and ice cream. Yummy!!! Then we spent the evening playing cards. Isn't he just the cutest!! I just love this man. He has brought so much adventure and happiness to my life. From camping, shooting guns, traveling, riding motorcycles to the birth of our girls. I never thought I would enjoy any of it but I do and I'm so thankful he has shared it all with me. I have been so blessed to have in my life. 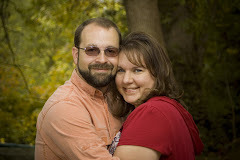 He is the best friend, handy man, Daddy, and Husband a girl could ever ask for. Thanks for all the blog lovin! Stay tuned. 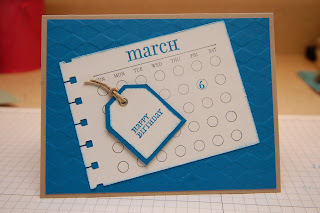 Several gals have asked about my stampin space. I will be posting pics soon. I'm so excited to show you. Thanks for checking in!! Have a great day!! Fun!! 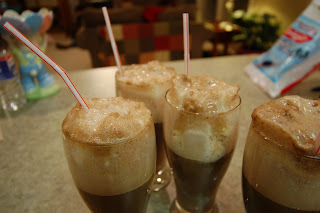 I would love to have rootbeer floats and play cards sometime!! Jason and I love having game nights.